Elvira Woodruff is the author of many popular books for children. Ten-year old Andy Manetti has never done anything magnificent. At least he has never done anything as magnificent as his stepbrother, “Mr. Gifted,” who has been showing him up in every way since he moved in with Andy and his dad four years ago. 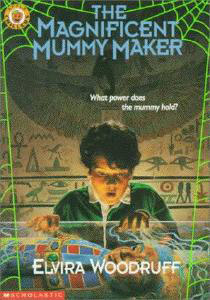 One day, after an odd encounter with an ancient mummy on a class trip to the museum, things begin to change for Andy. He suddenly can paint like a great artist, he can solve math problems, and even his handwriting seems to have become neater. But most amazing of all – everything he wishes for seems to be coming true. Andy is sure that he’s been infused with the mummy’s powerful spirit. Realizing the infinite possibilities for using this power, Andy tries to decide what to do. Should he wish for “Mr. Gifted” to disappear? Should he wish for his mother to be alive? Should he wish for world peace? In his struggle to make his final wish the best wish possible, Andy discovers the real power within himself – and how magnificent he has always been.